In the wake of America's withdrawal from both the Trans-Pacific Partnership (TPP) trade agreement and the Paris Accord on climate change, to say nothing of Washington's alienation of NATO allies, there lurks a mix of fear, bafflement, anger… and opportunity. Isn't there a little more room on the world stage now that one of its major players has shuffled off into the wings? Merkel announced to a beer hall rally, "The times when we could completely rely on others are, to an extent, over." With the United States out of the TPP, the influence of Xi's China in Asia and across the globe can only increase. As for Putin, as former Chairman of the House Intelligence Committee Mike Rogers put it on CNN when another commentator suggested they would be "giggling" in the Kremlin, "I don't think they're giggling. I think they are consuming large volumes of vodka in celebration," over Trump's troubles with a special prosecutor. So how are the great powers going to seize this opportunity? And how will lesser powers adapt to a new geopolitical regime? These are not just questions about trade blocs like NAFTA, the European Union and the TPP; these are questions about how we human beings relate to one another. ** Terrorists Have Been All Too Effective by Air and Land. What If They Hit by Sea? It has famously been said that the devastating 9/11 attacks were not a failure of intelligence but a failure of imagination. We simply were unable to conceive of al-Qaeda terrorists' turning commercial aircraft into a sophisticated air-to-ground attack system, killing thousands and changing the course of world history. In trying to predict other looming disasters, we need to open the portals of our imagination, and--unfortunately--we should turn our gaze to the sea. The discussion of “the drones” is pervasive. It has permeated popular culture from Helen Mirren in Hollywood to Anne Hathaway on Broadway and has been given not just column inches, but yards and maybe even miles in newspapers, magazines, blogs, and peer-reviewed journals. Philosophers, theologians, strategists, historians, psychologists, playwrights, film directors, poets, musicians, and anthropologists have, each according to the norms of his or her own discipline, engaged in important (and sometimes unimportant) questions about the Predator and Reaper (MQ-1/9). And, regardless of the discipline, the discussion is almost always about ethics. It is certainly worth talking about the ethics of killing and war and these conversations should surely include both civilians and military personnel. This is the case with any military activity that involves taking life, no matter the distance between combatants. But the discussion of remote weapons to this point has yielded little fruit. For so many words written and pages published, very little has actually been said. In many cases, the conversation has devolved such that it is no longer about drones — what the Air Force calls remotely piloted aircraft (RPA) — at all, but is instead about what people are saying about drones. With so few first-hand accounts available — descriptions of the crews’ lifestyles, the stresses they face, and the missions they fly — the references in the literature have become circular. One scholar cites another, who cites another, who cites, at best, a former MQ-1/9 crew member’s interview or memoir, and at worst, the first scholar in the chain. And round and round we go. The Project 2049 Institute is pleased to announce the publication of our latest Occasional Paper, "The Logic of Historical Nihilism: Analyzing the PRC Orthodoxy on the Origins of the Korean War." Dr. Miles M. Yu, professor of East Asia and military and naval history at the United States Naval Academy (USNA), examines the historical orthodoxy of Chinese Communist Party's (CCP) interpretation of the Korean War. Dr. Yu uses historical documents to trace how Joseph Stalin and Mao Zedong approved Kim Il-sung's plan to invade the South. He concluded that the CCP's misinterpretation of the Korean War from past to present is a matter of regime survival and is integral to Maoist historical nihilism. Following the recent 67th anniversary of the beginning of the Korean War, Dr. Yu's paper provides a timely and significant review of the Korean War's historical legacy, and the ways in which the manipulation of historical narratives is utilized by the CCP. "Since the start of the Korean War, however, the Chinese communist state propaganda system has carried out a seven-decade campaign of falsehood on the causes of the conflict by blaming the United States and the U.S.-backed South Korean government, established in 1948 under President Syngman Rhee, for "invading" North Korea. From the 1950s to the 1990s in China, this line of historical untruth was the only accepted narrative[...]. The communist government fabricated that orthodoxy in 1950 and it is still the official position of the Chinese Communist Party. The Chinese trijunction, marked by an arrow that claims it is under the 1890 Britain-China treaty, is at the Mount Gipmochi. 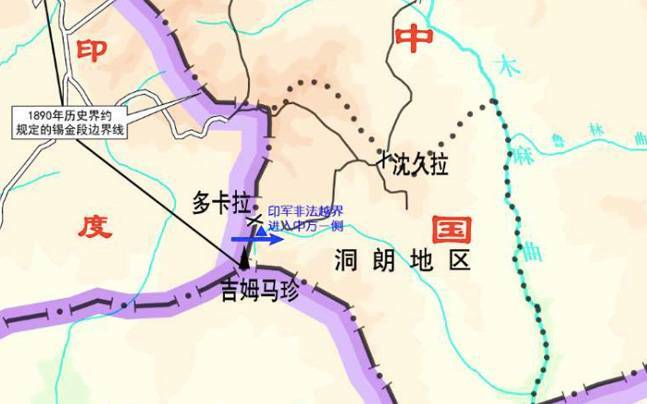 1 China has now released a map showing the site of the stand-off. 2 The map claims the Indian Army crossed the border at Doka La pass. 3 The map also reveals China's substantial territorial claims at the trijunction. Stepping up its claims that India had "trespassed", China has now released a map showing the site of the stand-off as well as China's territorial claims at the India-China-Bhutan trijunction that are in conflict with India's and Bhutan's claims. The map claims the Indian Army crossed the border at Doka La pass, depicted with a blue arrow, into the Doklam plateau which India and Bhutan see as Bhutanese territory but is claimed by China. The map, released on Friday, also reveals China's substantial territorial claims at the trijunction that are conflicting with India's and Bhutan's. It shows that China fixes the trijunction far south of where India and Bhutan do, which explains the current stand-off. Bhutan has refuted Beijing's contention that it (China) was constructing a road at the India-China-Bhutan tri-junction in an “indisputable” part of Chinese territory. Thimphu said it had conveyed to the Chinese government that this was not the case. In an indication that the trigger for the current standoff between India and China at Sikkim, which has led to Beijing closing the Nathu La Pass route for Kailash Mansarovar pilgrims, possibly arose from Bhutan’s concerns, Ambassador of the Royal Bhutanese Embassy in Delhi Major-General V. Namgyal told The Hindu that the road construction by the Chinese Army was “progressing towards” a camp of the Royal Bhutan Army at Zom Pelri. China and Bhutan have held 24 rounds of talks, with the last one in August 2016, to discuss the dispute part of the border. He did it. Prime Minister Narendra Modi did stride across to the other lectern and envelope US President Donald Trump in a hug. 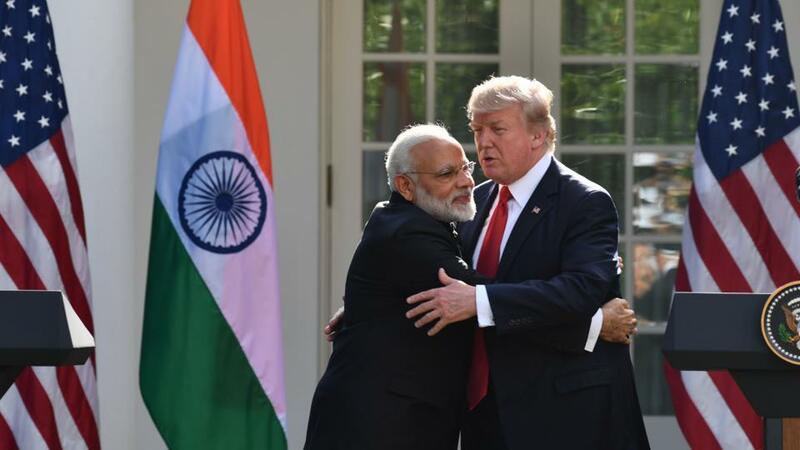 Now slo-mo that entire sequence and you’ll see that even when forewarned about the Indian leader doing precisely this, Trump was unprepared for the physicality of it, and with some awkwardness limply reciprocated by putting his arm around Modi’s shoulders. This was the PM’s way of imposing himself physically on his American counterpart, forcing him to react. This was no bad game play. But this imposition did not extend to the economic aspects of relations in the joint statement, where the US had its way. Sure, the designation of Syed Salahuddin of the Hizbul Mujahideen as global terrorist (GT) must have satisfied the Indian side enough for it to hold back on injecting anything remotely related to the free flow of services and skilled manpower (H!B visa issue) in the public statement by Modi. Moreover, while there was mention about destroying “radical Islamic terrorism” — which phrase for Trump was a repeat from his Riyadh summit with the Saud-led sunni collective, there was none about Pakistan, its role in using terrorism against India or Afghanistan, or any pointed reference as was sought by Delhi. The PLA spokesman’s response in relation to the current India-China standoff, that India should not forget the lesson of history, suggests that the PLA itself may have forgotten some. True, in 1962, the PLA roundly defeated the Indian Army. But in border skirmishes in 1967 in this very region, and in 1986-87, the Indian Army’s power play so rattled the PLA that it sacked its Tibet Military District Commander and its Military Region chief in Chengdu. In its own way, the present Chinese action in the India-Bhutan-China trijunction could well be an outcome of the event that many have forgotten. This is the conflict that developed in the Sumdorong Chu region, north of Tawang in 1986, and led to a major military push, Operation Falcon, led by the then Indian Army chief Gen Krishnaswamy Sundarji. At midnight on July 1, 1997, a red banner slowly rose over the banks of Victoria Harbor. Hong Kong was now back under China's authority after more than 150 years under British rule. Nearly 20 years later, the moment lives on in the minds of many. The transfer ceremony came to symbolize the official end of China's so-called "century of humiliation," which began with the Sino-British opium wars and put the country under the thumb of successive Western and Japanese imperial forces. Overnight, the freewheeling capitalist playground of Hong Kong came under the control of an emerging socialist superpower. But hammering out the details of the transfer was a longer and more complicated process. Throughout 13 years of negotiations, Hong Kong's residents and leaders vacillated among feelings of resentment toward colonial rule, affinity with the mainland that shared so much of its culture and history, and suspicion about its prospective new governing authority. The resulting "One Country, Two Systems" agreement promised to preserve Hong Kong's economic and cultural conventions for 50 years, until 2047. Now, on the eve of the turnover's 20th anniversary, Hong Kong has reached a decisive moment in its relations with Beijing. The Army chief is expected to visit Sikkim as early as Thursday to review the tense standoff between Indian and Chinese troops, even as military officers said that such standoffs were not unprecedented. Army sources said General Bipin Rawat could visit Sikkim at the earliest to review the situation where standoff between troops of both sides is believed to be continuing. According to reliable sources, Indian Army troops objected to the Chinese soldiers carrying out construction on a road stretch through the disputed Dolam Plateau (Donglang or Doklam), triggering the confrontation. In response, Chinese authorities denied entry to pilgrims for Kailash Mansarovar Yatra via the Nathua La pass. DATONG — "It's the end of a story," sighs Chen Yixian. The slender 56-year-old wears a permanent smile, but it can hardly conceal his despair as he watches bulldozers and trucks laboriously pushing their loads in the distance. In this huge open-pit mine at Sandu, 400 kilometers southwest of Beijing, all color seems to have disappeared. Coal is everywhere, the mountain excavated a little more each day. The intermittent palisades cannot prevent the thick black dust from invading the surrounding roads and villages. Mining activity in the province of Shanxi is visible for miles around: not only the pervasive dark dust, but also the smell of sulfur that permeates the atmosphere. On this spring day, the sky is blue and the sun is visible, a luxury in a region that is among the most polluted in China. It is also the result of a fall from grace of a once glorious industry. A few years ago, Chen Yixian was rubbing his hands together. He came to Shanxi as a miner before deciding to buy a mine with other investors in 2006. "At the time, you could buy a big mine for a few million yuan," he recalls. He witnessed the surge in the price of coking coal, boosted by the extraordinary demand of a Chinese economy with double-digit growth rates. "The inhabitants were even digging behind their houses!" he recalls. The wealthy owners of private mines made millions. WASHINGTON — The Islamic State has carried out nearly 1,500 attacks in 16 cities across Iraq and Syria after they were declared freed from the militants’ control in recent months, providing new evidence that the group is reverting to its insurgent roots and foreshadowing long-term security threats. The information was compiled by the Combating Terrorism Center at West Point in a study made public on Thursday that warns that any military gains will fall short without increased efforts to restore the security, governance and economies in territory once held by the Islamic State. “Pushing the Islamic State out as the formal governing party in a territory is not a sufficient development when it comes to ending the group’s ability to enact violence against individuals in Iraq and Syria,” the 20-page report said. American diplomatic and military leaders say an even greater challenge than ousting the Islamic State, or ISIS, from its self-declared religious state, or caliphate, in eastern Syria and northern and western Iraq may well be the daunting political and economic reconstruction in the years ahead. Battered within the caliphate, its regional wilayats under increasing pressure, the Islamic State has turned to the final component of its being — an international “cloud” of aspirants — to conduct an asymmetric urban guerrilla campaign against the civilian populations of those countries aligned against it, specifically targeting Western nations. A steady bloodletting, they calculate, will keep the Islamic State in the 24-hour news cycle, send a message of relevance, strength, and defiance to the international community, and, most consequentially, erode popular support in these key countries for the coalition war against the Islamic State. Ultimately, the Islamic State leadership calculates, this theory of victory will lead to the ultimate achievement of their political objective. If and when we defeat ISIS in Iraq and Syria, what comes next? Ideally, American allies would defeat the world’s most vicious terrorists, the warring parties in Syria would then have the space to reach a political settlement, and a genocidal civil war would finally end. Yet when ideals meet the hatred and confusion of the Middle East, ideals always lose. The Al Mou’meneen Mosque is not far from the mortar factory, and it is here that the group from the farmhouse prayed and brought terror to the local neighbourhood. The mosque is modest and mostly without adornment. It is a bright spring day, and children are making their way home from school. But I have a sense of trepidation as I knock on the metal door. Is the imam who dedicated the book to the fighters still inside? The caretaker answers and welcomes me inside. 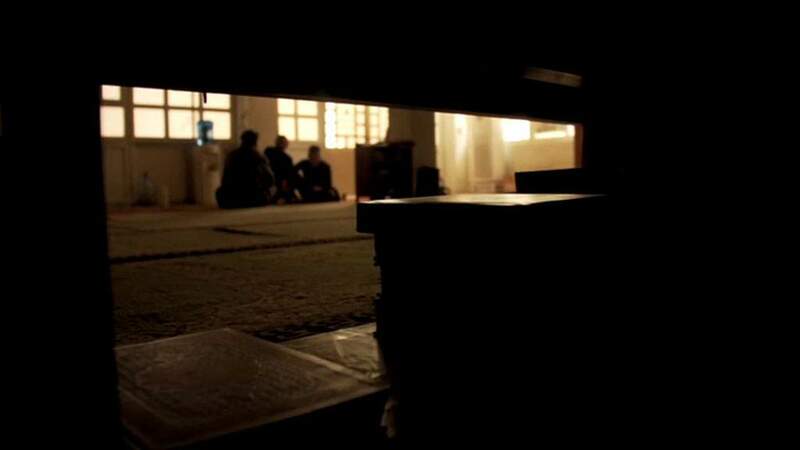 I take off my shoes and he sends a boy to find the imam. I sit waiting in the sunshine, drinking some sweet tea, listening to the children playing outside. The imam who signed the book is long gone, he fled with IS. So the caretaker calls to find the man who led prayers before IS took control of Mosul. The imam arrives, his name is Fares Fadel Ibrahim. He is younger than I expected, broad-shouldered and with a quiet confidence. I show him the pictures of the fighters and he recognises most of them. After a U.S. F-18 shot down a Syrian fighter-bomber last week, Assad’s ally, Russia, declared that it would consider shooting down any U.S. aircraft west of the Euphrates river. The White House defiantly declared the US would defend itself if attacked. Risking a war with a nuclear power over a Syrian policy that does not advance core American interests is foolhardy. We must make an immediate change in strategy. The overriding imperative for the U.S. Government is to ensure the security of the U.S. Homeland and its people abroad. Secondly, it is to expand global trade and improve the domestic U.S. economy. While fostering and encouraging the spread of democracy abroad remains a U.S. interest, it is not a core interest on par with the first two. Given these criteria, our current Middle East and Syria policies require considerable and immediate adjustment. The primary justification for U.S. involvement in the Syrian civil war is the requirement to destroy Daesh’s (aka the Islamic State) self-proclaimed capital of Raqqa. To accomplish that goal, the Pentagon supports indigenous forces with airpower and select U.S. ground troops. But even if that goal were one day accomplished, it would neither solve the civil war nor remove the threat of Islamic terrorism to the United States. The region is a volatile, violent mix of a myriad of aggressive and competing interests. Coming on the heels of the Manchester terror attack targeting British youth, the recent terrorist act in London is the last in a series of attacks across Europe that displayed the eerie savagery of violence carried out in the name of Islam. The Islamic State claimed credit and proclaimed that a detachment of its fighters carried out the terror attack. British prime minister Theresa May condemned the attack and assertively declared that “enough is enough.” She vowed to undertake a sweeping review of Great Britain’s counterterrorism strategy, even though the British security apparatus has formidable surveillance and security laws. This provoked a national debate about balancing civil liberties and security. The problem, however, goes beyond fending off terror acts or revising counterterrorism strategies. The problem is about how to reverse decades-long policies of promoting unbridled multiculturalism that allowed the ideologies of Islamism and Salafism to permeate an inchoate European Muslim society, thereby militating against the creation of an European Islam free from the ideological baggage exported by conservative and Islamist individuals, groups and governments. The extent to which this problem has been difficult to gauge lies squarely in the haughty—yet self-loathing—contemporary thought of the West, which has prevented a civilized and honest critique of Islam’s inability to reform its perversions. New sources, mobility, and industry fragmentation are set to disrupt the system. Change is afoot in the energy system. Soaring demand in emerging markets, new energy sources, and the likely growth of electric vehicles (EVs) are just some of the elements disrupting the status quo. It is hard to discern how the aftershocks will affect the extraordinarily complex network of sectors and stakeholders. New research by McKinsey and the World Economic Forum has identified the game changers for companies and policy makers, as well as their implications. For the U.S. Army, the global war on terror is beginning to look like the good old days. It was a long fight that is not yet over, and as usual, the Army has suffered most of the joint-force casualties, but at least terrorists don't have long-range fires, tactical aircraft, heavy armor, sophisticated cyber weapons or electronic-warfare capabilities. The next time around, the bad guys could have all those things and more. The Army can't even count on having local air superiority if it is forced to fight the Russians in Eastern Europe (Russian air defenses are really dense). Geography could prevent America's sea services from participating in a big way. So for the first time in its recent history, the Army might be completely on its own fighting Russia's rapidly modernizing military. Which raises the obvious question of what the Army should be doing right now to get ready for a fight that might be only two or three years away. This is not a situation where new program starts are likely to be much help. The Army's leadership will have to improvise by upgrading, protecting and proliferating what it already has. Probably the most important item is to assure commanders have a battlefield network that can survive. Without resilient links to maneuver forces, commanders would not be able to sustain an organized campaign against a numerically superior and well-equipped enemy. Often high-tech doesn’t work right away, or takes longer than expected to perform to its full potential. Actually, that happens more often than anyone would like to admit. A current example is a new Israeli aerial surveillance system called SkEye. This is a multicamera system built into a UAV as small as the Hermes 450 (max payload 150 kg) or even small manned aircraft like the single engine Cessna 208B. SkEye uses ten high-resolution video cameras to simultaneously watch, track and record activity in an areas as large as 80 square kilometers at a time. SkEye uses digital image scanning software to seek out specific items and patterns of movement below. Since SkEye records all that it sees it can also patternsover time. This approach to aerial surveillance has existed in theory for decades but the technology to make it work didn’t exist until after the 1990s when the U.S. Army needed an effective way to find newly placed roadside bombs and landmines in Iraq and Afghanistan. The Americans spent billions on this bomb detection program and in 2005 the first workable, although somewhat crude, system (“Constant Hawk”) showed up and worked so well that the army named Constant Hawk one of the top ten inventions for 2006. The army does this to give some of the more obscure, yet very valuable, developments some well-deserved recognition. Constant Hawk, like most new technology did not get a lot of media attention. Mainly it’s the math, and TV audiences that get uneasy watching a geek trying to explain this stuff in something resembling English. But it worked, and the troops wanted more of it. Tools like this were popular mainly because the system retains photos of areas troops have patrolled, and allows them to retrieve photos of a particular place on a particular day. Often, the troops returning from, or going out on a patrol, can use the pattern analysis skills we all have, to spot something suspicious, or potentially so. How many people specifically know where you are right now? Some friends and family? Your coworkers, maybe? If you’re using a Windows laptop or PC you could add another group to the list: the CIA. New documents released on Wednesday as part of WikiLeaks’ series of CIA hacking revelations detail a method the agency uses to geolocate computers and the people using them. The agency infects target devices with malware that can then check which public Wi-Fi networks a given computer can connect to at a given moment, as well as the signal strengths of those networks. From there, the malware compares the list of available Wi-Fi options to databases of public Wi-Fi networks to figure out roughly where the device is. “Basic blocking and tackling matter,” said Joyce, who sat in on some of the closed-door sessions attended by leaders of companies like Amazon, Microsoft, IBM, Apple and others as part of the administration’s tech week. “Do all the things you should be doing,” he added. Following the Office of Personnel Management hack that exposed sensitive information of millions of security clearance holders, the federal government embarked on doing exactly that, coordinating a cyber-sprint to shore up obvious vulnerabilities. President Donald Trump’s cyber executive order aims to maintain that increased emphasis on securing federal networks. The FBI has interviewed several U.S.-based employees of the Russian cybersecurity firm Kaspersky Lab as part of its investigation into the company’s operations. FBI agents reportedly visited the homes of Kaspersky employees late on June 27 in several U.S. cities and had “brief interactions” with them, though no search warrants were served, Reuters reported. Isaeli general: Cyber terror - why are global leaders waiting for their cyber 9/11? As a former Brigadier General in Israel’s Military Intelligence, I am today reminded of a German word one of my commanders, a former Prime Minister and Chief of Staff, used to throw around: Gestalt. Gestalt, literally meaning shape, has a deeper meaning in the world of philosophy and psychology, referring to a complex holistic world. It stands for an idea where all systems should be viewed as a whole; where everything is interconnected. It took two planes and thousands of murdered Americans for world governments to realize that the fight against terror involves cooperation and intelligence sharing - 9/11 was the wake-up call for governments to centralize their efforts, and take a holistic and eventually strategic view of the inter-agency and multi-disciplinary fight against terrorism. As important as a platform is to conduct missions, so too are tools. As mentioned in Part II, U.S. Cyber Command as a war-fighting organization will require different tools than the National Security Agency, which serves as an intelligence organization. Cyber Command's tools would be meant to be attributed to the Pentagon in a war scenario; obfuscating attribution won’t be a necessary endeavor. “The tools are different. Tools designed to reside and extract information might be different than tools designed to delay, degrade, disrupt and all that,” Michael Hayden, former director of the NSA and the CIA, told C4ISRNET in a recent interview. Hayden also commanded the first military and offensive cyber-oriented organization — Joint Functional Component Command-Network Warfare, CYBERCOM's direct predecessor. The electric grid often utilizes industrial control systems to automate generation, transmission and distribution. As utilities adopt digital technologies to keep up with electricity demand and consumption, cyber attack vulnerabilities increase and new entry points emerge. Many public utilities commissions (PUCs) have not required utilities to boost their cybersecurity, placing customer electricity access in jeopardy. Regulators need to incentivize and mandate cybersecurity standards for utilities. Utilities operate the distribution part of the grid -- the final stage where electricity is delivered to customers. Currently, mandatory cybersecurity standards only exist for the bulk power portion of the electric grid, but not the distribution system. The distribution system delivers electricity to pipelines, medical facilities, telecommunications, military bases and other critical infrastructure. If a successful cyber attack on the distribution system disrupts electricity, devastating economic and security consequences can result. Clearly, the distribution system also needs to be protected to prevent damage to the bulk power system.